The project was able to generate more than a million kilowatt hours each year when it debuted two years ago. Now, the 2,900 solar panels at Farmers Electric Cooperative (FEC) will become more numerous with the installation of another 2,880 solar panels, taking the solar array size to nearly two megawatts. Read more. Solar panels at Farmers Electric Cooperative will number nearly 6,000 when crews from Iowa Wind and Solar complete the job early next week. Drone photo by Joseph C. Ace / Iowa Wind and Solar. Electric Co-ops’ Solar Projects Growing in Size and Scope, Press Release, National Rural Electric Cooperative Association (NRECA). “The SUNDA tools enable any and all of the nation’s 900 electric co-ops to make an informed decision for their consumer-members and, for those co-ops intending to deploy solar, reduce the risks and maximize the benefits.” Cooperatives have expanded the collective solar footprint, and individual projects are getting bigger; the average SUNDA community solar project is now 1.5 megawatts. SUNDA: Solar Utility Network Deployment Acceleration Project. Learn more about SUNDA, available resources and tools, and participating co-ops by clicking on this highlighted link. According to the NRECA, there are currently 323 cooperatives in 38 states that utilize solar as a fuel source. There are 6 in Nebraska, more than in many other states, the data at this link show. 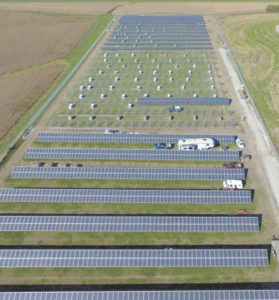 This entry was posted in Community-Scale Solar, Nebraska / Midwest News, NewsBlog and tagged Farmers Electric Cooperative in Iowa, Iowa Wind and Solar, National Rural Electric Cooperative Association (NRECA), Nebraskans for Solar, Solar Utility Network Deployment Acceleration (SUNDA), The Kalona News on October 15, 2016 by Helen Deffenbacher.